Nestled outside beneath tall red rocks, a pool and hot tubs offer total relaxation in a tranquil setting. Common areas included a crystal grotto, lemon-water stations, and flute accompaniment. 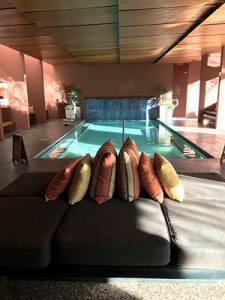 The spa menu offers 72 treatments, reflecting the Native American culture, traditional Swedish massage, and non-traditional such as past life regression. Indulgent treatment rooms have large windows that stream light and face tranquil views. I chose an Oxygen Facial, a Pinion Scrub and three unusual treatments that were outstanding. This massage is on a table in loose clothing, rather than the floor mat used in traditional Thai massage. I was guided into gentle stretches and yoga positions that were challenging but not uncomfortable. Goodbye kinks. 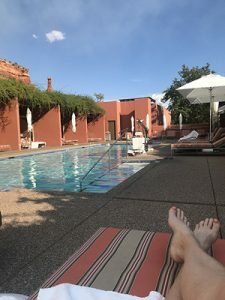 As I sank into the private, outdoor 93-degree therapy pool, my therapist said, “Your job is to breathe and be like seaweed.” My body was swirled and stretched until I felt did indeed feel like seaweed. Ah, relaxation. An ancient form of detoxifying, energizing, and massaging just the abdomen, known as “working the energy of the internal organs,” is said to be good for releasing emotional and physical blocks. Subtle release. To learn more about Mii Amo Spa, visit their website – https://www.miiamo.com/. 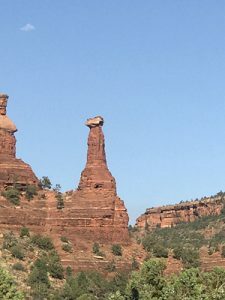 They are located at 525 Boynton Canyon Road, Sedona Arizona. Phone 928.203.8500.